No place on earth is filled with so much activity and excitement as New York City during the holiday season. From before Thanksgiving through their unbeatable New Year�s celebrations, it is electric. 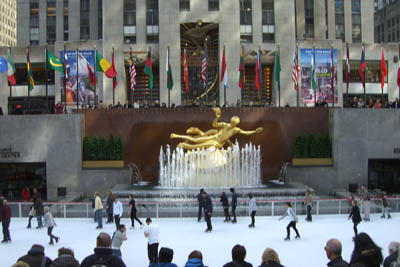 In December the tree will be lit at Rockefeller Center, where diners at The Rink, a Patina owned restaurant, can view all the color and action on the ice, or show up early to watch NBC outside events planned for the holidays. 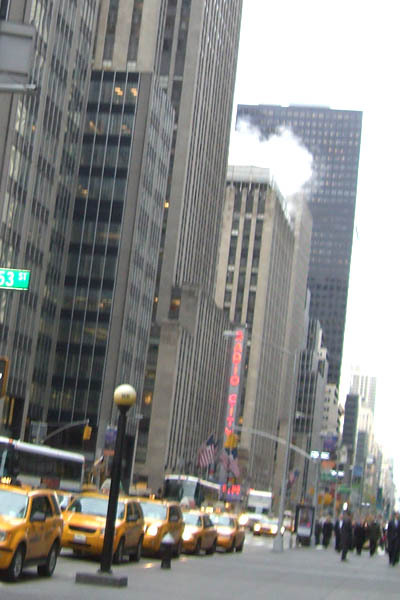 A trip to the �Top of the Rock� offers great views of the �big apple� and the entire building is a historic trip down memory lane. 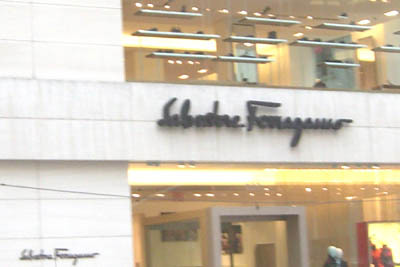 Shopping is the bomb in New York, and crowds pack the favorite venues on 5th Avenue, as well as Madison Avenue. All the wonderful designer venues are filled with their newest items for holiday shoppers, and outdoor vendors or the many museum shops offer great little last minute gifts to take home. Walking along these famous streets is so amazing, especially throughout the holiday season. If you want a fabulous lunch at the Waldorf, or you must have an organic salad you will find it here. One of the eco-inspired New York deli�s is Simply Food, a quick lunch place that serves everything healthy, including individually created salads and dressings, and delicious home made soups. Take-away soup and sandwich shops seem to be a favorite for people working in the Manhattan area. In November, during my visit, it was still warm and people would sit in open areas enjoying a quick lunch. The Bull & Bear, a respected steak house in the Waldorf, is so old fashioned and wonderful. They are described as the classiest spot in midtown to get a drink, and offer white glove service. This grand hotel has floors filled with historic photos, including one of Grace Kelly and Prince Reiner of Monaco at their engagement party held at the Waldorf Astoria. 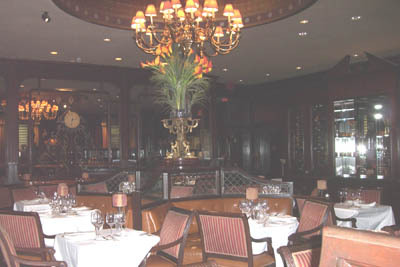 Additional dining attractions in the Waldorf include the beautiful Peacock Alley, and Oscar�s. Deli is king in New York. 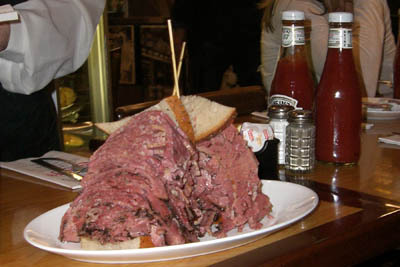 The Carnegie Deli on 7th was more fun than a trip to Las Vegas. Our gum-chewing, fast-talking elderly waitress would be a perfect cast for a QuentinTarantino film. She was so entertaining, and the portions she brought us were outrageous, as well as delicious. A publisher friend from New York once told me that LA did not have any deli food, and I was insulted. However, the truth is that New York has the best deli food on the entire planet. You might also want to visit the Stage Deli on 7th, 2nd Avenue Deli, Sarge�s on 3rd or Barney Greengrass on 86th. 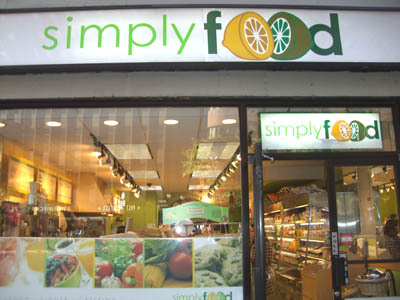 They are all home to New York deli specialties. 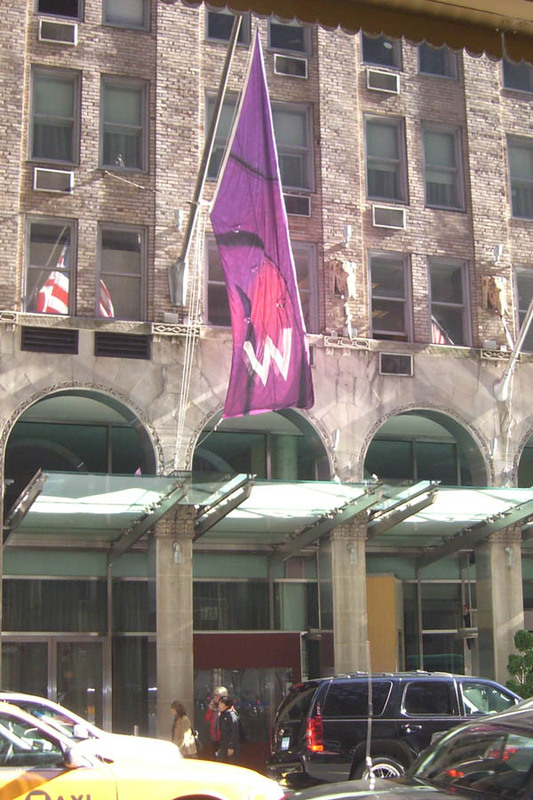 Across the street from the Waldorf on Lexington is the W New York, a sleek modern meeting place for the young movers & shakers in New York. The Oasis lobby bar and W Cafe is always overflowing with patrons, and the Whiskey Blue in the hotel is alive and goes nearly all night. There is something for everyone on this hotel lined avenue, and the area offers easy access to the Metro. The Metro was one of my favorite things about New York, and saves endless time and huge amounts of taxi dollars. All the concierges in the hotels help you map out your destinations, and people on the street and on the Metro are amazingly helpful. The people in New York are the best! Another fun discovery is the Chelsea Market. This ancient structure now houses everything amazing in food and drink, and is also home to the Food Network. From home-made bread, to artistic cupcakes, to fine wine, to candy fantasies, it is all in this wonderful building of timeless temptations. Just sitting in the lobby and people watching over a bagel and coffee is an amazing experience. Recently Mayor Blumberg of New York worked with the tourism professionals and created NYC, a great looking visitor center filled with maps, and information on every single thing going on, as well as transportation information, and a City Pass that tourists can buy for a set fee and get into numerous attractions for free. 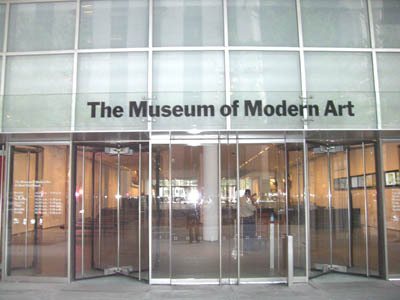 Visit: www.NYC.com. The City Pass is the best way to see all the sights at an affordable price. Visit: www.citypass.com for additional information and contacts. This February, winter sports fans can join the U.S. Olympic Committee (USOC) on a trip of a lifetime to the 2010 Olympic Winter Games in Vancouver, Canada. The USOC's Olympic Friends and Family Program is a world-class hospitality program bringing fans close to the action while also helping to raise funds to support Team USA and the U.S. Olympic Movement. "This hospitality program is a wonderful opportunity for fans to witness amazing Olympic moments, share in the celebrations and meet remarkable athletes," said USOC Chief Development Officer Janine Alfano. "At the same time, it is a key fundraising program that helps fund athletes going to the Games and supports future Olympians to represent America on the world's greatest athletic stage." Donors receive personalized recommendations for activities and services in Vancouver, invitations to private receptions with Olympians, and access to the exclusive USA House, the hospitality headquarters to the U.S. Olympic family. Accommodations, tickets and transportation are not included. This six-day/five-night experience for two takes sporting fans to the best of the Olympic Winter Games and Vancouver including a luxury stay at the Four Seasons, comfortable transportation in an Olympic accredited motor coach, premier Olympic tickets to a variety of popular events (seats are classified as 'the best' by the Vancouver Olympic Organizing Committee), VIP receptions and access to the USOC's exclusive USA House to meet Olympic athletes. VIP guests also will attend medal ceremonies and celebrations, as well as intimate dining experiences at some of British Columbia's finest restaurants, full-time concierge service and outfitting in the hottest Olympic apparel. Airfare is not included. "There is nothing like watching Olympic competition firsthand, and the USOC's Friends and Family VIP Hospitality Program provides donors with an insider's perspective of what it's really like for Olympic and Paralympic athletes," said Mari Sinton Martinez (Colorado Springs, Colo.) who, together with her husband Paul, are members of the Friends and Family Program. "We've participated in their VIP Programs in both Torino and Beijing, and can't wait for Vancouver. By experiencing the Olympic Games with USOC staff and fellow contributors and by meeting members of the U.S. Team, we really felt a part of the Olympic Movement. The Games are exhilarating and will fill you with national pride. Plus, the USOC donor hospitality team takes care of every detail so all you have to do is sit back and enjoy!" The USOC Friends and Family Program, portions of which are tax deductible, helps raise funds to support Team USA at the Olympic and Paralympic Games. Funds also support the needs of America's aspiring Olympians and Paralympians. For more information on the USOC Friends and Family Program, interested participants can visit www.teamusa2010.org or contact the USOC's Development Division at 1-800-775-8762. Similar VIP opportunities are available for London 2012 and Sochi 2014. The United States Olympic Committee (USOC) is recognized by the International Olympic Committee as the sole entity in the United States whose mission involves training, entering and underwriting the full expenses for the U.S. teams in the Olympic, Paralympic, Pan American and Parapan American Games. In addition to being the steward of the U.S. Olympic Movement, the USOC is the moving force for support of sports in the United States that are on the program of the Olympic, Paralympic, Pan American and Parapan American Games. Follow us on Twitter ( @USOlympic) or visit our website at www.teamusa.org. Holland America Line�s ms Nieuw Amsterdam, currently under construction at Fincantieri shipyard, was floated out of its dry dock at Marghera, Italy, Friday, Oct. 30, 2009. The floating out � considered a significant milestone in the construction process � was prefaced by several traditional ceremonies. Following the ancient practice of shipbuilders, two commemorative coins were sealed in a compartment in the traditional Coin-Under-the-Mast ceremony, believed to bring good fortune to a vessel. The special coins used in the ceremony were minted to commemorate the 400th anniversary of Henry Hudson's discovery of the river in New York that bears his name. In 1609, Hudson, an English explorer employed by the Dutch East India Company, sailed his ship Half Moon up that river. Hudson�s explorations eventually led to the first permanent Dutch settlement in North America � a tiny village on the southern tip of Manhattan Island, which was named Nieuw Amsterdam. In recognition of that longstanding connection, several rooms on Nieuw Amsterdam will have New York City themes. The main restaurant is the Manhattan Dining Room, the atrium art is inspired by the city�s skyscrapers and the youth area will feature an authentic 1981 New York Checker cab. After the blessing of the ship and the ceremonies, floodgates on the dry dock were opened. As the dock began to fill, a bucket was lowered into the water and some of the first water to touch the ship's hull was captured and preserved in a crystal bottle that is presented to the captain during the ship�s official dedication. Nieuw Amsterdam was towed to the fitting-out dock where it will be finished and delivered in early July 2010. She is a sister-ship to the ms Eurodam, the second in the Signature Class series and will carry 2,106 guests and 929 crew. For more information visit the ms Nieuw Amsterdam microsite located on www.hollandamerica.com in the Quick Links area of the homepage, consult a travel agent, or call 1-877-SAIL-HAL (877-724-5425). The Hotel de Charme Les Airelles, the five-star ski resort in one of the world�s most exclusive winter destinations, announces the addition of the new Chalet Ormello, a private ski villa. The recently acquired chalet underwent a million Euro renovation and will debut with the 2009/2010-winter season reopening on December 11. 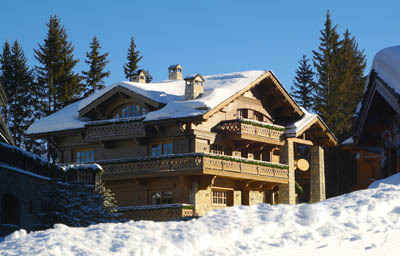 Just steps from the Bellec�te slopes amidst a breathtaking mountain setting, the 3,000 square-foot chalet offers guests five floors of secluded luxury, comfort and a multitude of modern amenities including a private Valmont Spa, swimming pool and Jacuzzi, steam room, fitness room, and film screening room. Chalet Ormello is the perfect holiday destination for large groups or families, comfortably accommodating up to 15 guests complete with seven double bedrooms, two master bedrooms and ample lounging areas. Each of the five floors is decorated with finely appointed furnishings in a traditional style with an emphasis on modern comfort. 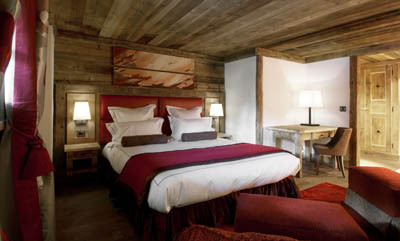 Textured wood accents contribute to the chalet�s rustic but elegant feel, complimenting the soft lighting and rich fabrics. The ground floor features a spacious ski room, professional kitchen and three en-suite double bedrooms, while the above first floor houses the two master bedrooms with fireplaces. The main second floor is home to an expansive lounge area with fireplace, a second kitchen and dining room, a perfect spot to gather after a day on the slopes. On these floors, guests can enjoy picturesque views from multiple balconies, over looking these legendary mountains. Directly below the ground floor guests will find two en-suite bedrooms, and two bedrooms with personal shower rooms. The bottommost floor features the luxurious swimming pool and outdoor Jacuzzi steam room, as well as a fitness and massage room providing the perfect opportunity for utter relaxation and privacy. Large parties will enjoy the expansive and well-stocked bar, and families will appreciate the spacious playing room for kids, who also have their own Children�s Kingdom facility as part of the main hotel. All guests are sure to be entertained by the in-house cinema, complete with cushy chaise lounges and a theatre-sized screen. In addition to these world-class amenities, the Chalet Ormello also offers an array of services designed to meet guest�s every need. A concierge and private chef are available free of charge, as are housekeeping, shuttle and security services. Services available upon request include ski instructors and equipment, passes to the slopes, babysitting, and beauty care Valmont treatments, such as massages, a hairdresser or a personal trainer for those guests wishing to be pampered in privacy. ... courtesy of Royal Caribbean International's Oasis of the Seas. The first in the line's all-new and awe-inspiring Oasis-class of vessels, Oasis of the Seas set sail November 19, 2009 as the largest and most revolutionary ship at sea. Boasting 2,700 staterooms and capable of carrying approximately 5,400 passengers, Oasis of the Seas spans 16 different decks and encompass 220,000 gross-registered tons. And once again, Royal Caribbean has raised the bar when it comes to shipboard innovations. Royal's ground-breaking "neighborhood" concept will provide passengers with the opportunity to seek out relevant experiences based on personal preferences, styles, moods, and age group. 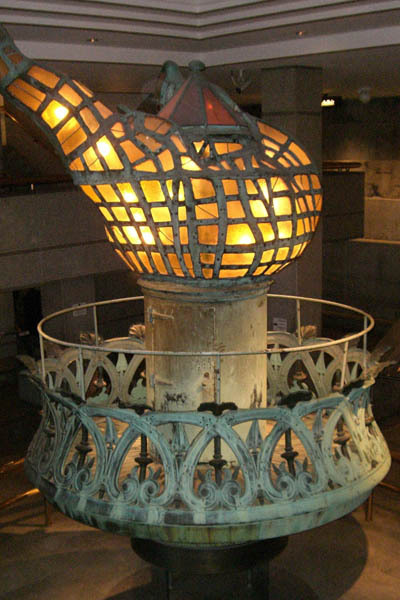 Highlights include an enormous open-air "Central Park" situated in the middle of the vessel (containing actual trees, grass, gardens, and more), Boardwalk (reminiscent of New England's nostalgic seaside piers and classic amusement parks like Coney Island), AquaTheater (cruising's first multi-purpose amphitheater), the Vitality At Sea Spa & Fitness Center (boasting the industry's largest and most comprehensive selection of wellness treatments and facilities), an enormous Pool & Sports Zone encompassing an entire deck of the ship, and the Youth Zone (home to the cruise line's award-winning Adventure Ocean youth program, now featuring more dedicated spaces for children and teens than ever before). The H�tel du Palais, a five-star resort and spa located on the pristine beaches of Biarritz, is pleased to announce a series of exclusive galas and events for the upcoming holiday season. On December 24, the H�tel du Palais will host their magnificent Christmas Eve Gala, complete with exceptional live entertainment and exquisite gourmet dining. Guests will dance the night away to the sultry sounds of the crooning Betty Bea Duo, specializing in European and international jazz and blues. As for dining, leave the milk and cookies for Santa. Gala guests will enjoy the finest European fare, including succulent duck foies gras with raspberry chutney, a cushion of queen scallops scented with the rare black truffle, sinfully rich chocolates, delicate mignardises, and much more. The decadence continues on January 31 at the New Year�s Eve Gala. Celebrate the final moments of 2009 with an evening of wining and dining, dancing and romancing. The All Stars Grand Orchestra will provide the perfect backdrop for champagne toasts and midnight kisses, and is sure to keep guests on dance floor well after the clock strikes twelve. Gourmands will delight in the tantalizing menu, which includes lobster with grains of the finest Aquitaine caviar, ravioli of scallops in truffle-scented leek bouillon, a wide array of sweet treats, and much more. A variety of fine wines and Cuv�e Prestige champagne will be flowing throughout the evening. The holiday festivities do not end at midnight. Guests can begin 2010 in opulence with the Imperial New Year�s Day Brunch. Distinguished Chef Jean-Marie Gautier will please the most discerning palettes with an endless parade of hors d��uvres, soups, fish, entrees and pastries. Located in the sumptuously decorated La Rotonde restaurant, guests can enjoy breathtaking panoramic views of the Grande Plage and the Biarritz lighthouse while sampling Gautier�s award-winning cuisine. As with the New Year�s Eve Gala, champagne will be free-flowing at this elegant reception. The H�tel du Palais is celebrating the holidays not only with fine food and sophisticated soirees, but also with music. Violinist Kristi Gjezi and pianist Andoni Aguirre will take the stage at the Imperial Ballroom on December 27 at 8:30 p.m. Both highly-accomplished musicians, Gjezi took first prize at the Avignon International Violin Competition in 2005, and Aguirre was trained at the prestigious Conservatoire National Sup�rieur de Musique de Paris. On December 29, guests at the H�tel du Palais will enjoy a guitar performance by Le Duo de Guitares de Paris. The show will take place in the Imperial Ballroom at 8 p.m. and will feature the virtuoso talent of Michel Sadanowsky and Thierry L�bre. The duo will delight audiences with a variety of jazz and flamenco, as well as the music of Georges Brassens. Nightly accommodations begin at 420 � for two people and 300 � for one person. Tickets to the Christmas Eve Gala are 265 � and include entrance, entertainment, meal, champagne ap�rtif and wines. Evening dress is required. Tickets to the New Year�s Eve Gala are 535 � and include entrance, entertainment, meal, champagne ap�rtif, wines and Cuv�e Prestige champagne. Dress is formal. Tickets for the Imperial New Year�s Day Brunch are 185 � and include entrance, meal and champagne. For more information, please call (33). (0).5.59.41.64.00 or visit www.hotel-du-palais.com. Built in 1855 by Napoleon III as a summer mansion for Empress Eugenia, Hotel du Palais is now among the most beautiful hotels in the world, overlooking the beach and the Atlantic Ocean. Owned by the city of Biarritz, the hotel has been permanently restored and now boasts a glamorous five-story Guerlain spa. According to readers, this "absolutely grandiose oceanfront villa" in the Basque Country has interiors with restored nineteenth-century antiques. Rooms with balconies and Atlantic views contain furniture and decorations dating from the Second Empire. The hotel's luxury and ageless charm, coupled with its outstanding sports facilities and little-surfing culture, make the Palais an international center for vacationers and sports enthusiasts alike. For more information or to make a reservation, please visit www.hotel-du-palais.com or call +33 (0) 5 59 41 64 00. "My favorite things about the holidays are the sensory ones, the aromas - apple cider, freshly baked cookies, cinnamon; the sounds - bells ringing, carolers, and the hustle and bustle in the streets, with everyone rushing from State Street shops and parties and school plays, trying to fit in all the last minute cheer before the year ends, its truly an energy all to itself." Canary Hotel is the perfect place to escape and check everyone off your list this holiday season. With State Street being just a short stroll away, shop at ease at countless boutiques and specialty stores while avoiding overcrowded malls and parking structures. After a busy day of shopping return to Canary Hotel where a glass of wine and an in-room massage await. Don't feel like leaving your all too comfortable guestroom? Room Service will be right up! Relax and enjoy this holiday season at Canary Hotel! Join us this Holiday Season at Coast Restaurant for an unforgettable meal and setting. Our chefs have created fresh menus featuring seasonal dishes and traditional items to satisfy everyone's tastes. To view holiday menus, prices and times please click here. Nothing quite embodies the magic of the holiday season like going to the theatre. The beautifully restored Granada, just a few blocks from Canary Hotel, is the perfect place to take the family for a festive outing. To view a complete listing of events at the Granada Theatre click here. The Bettoja Hotels are luring North American travelers to Rome and Florence this winter with incredible offers good for the pocketbook and intellect. The Art and Culture City Package , valid until March 2010, offers free entrance tickets to various exhibits throughout Rome which includes, Rome, The painting of an Empire (now until January 17, 2001) and Calder (now until February 14th, 2010). Also included are welcome drinks, 15% discount on meals at either Mediterraneo or Massimo D'Azeglio restaurants, buffet breakfast daily and taxes. Rates for two are from: 260 Euros at the Nord, 280 at Hotel Atlantico, 300 at Massimo D'Azeglio, and 320 at Hotel Mediterraneo. There is a minimum two night stay for this package. Christmas and New Year Packages are also available including gala gourmet dinners, presents, music, dancing and midnight toasts overlooking all of Rome. The Bettoja family members are long time Romans and love their less crowded city in the winter. They have researched the many special exhibits, concerts and museum activities for the off-season and have them available on their web site or at the front desk. The Concierge will procure tickets in advance. The Bettoja Hotels are the largest family-owned group in Italy with four properties in Rome and one in Florence. Their Rome hotels, Hotel Mediterraneo, Hotel Massimo D'Azeglio, Hotel Atlantico and Nord are all located within walking distance of the Colosseum, Opera House, Roman Museum, Via Veneto and Spanish Steps. Their property in Florence, Relais Certosa is a charming country villa just 10 minutes from the city center. Good food and warm personal service has been the Bettoja mantra through five generations. The family and staff have not wavered from their promise to maintain high standards and good value. Lake Arrowhead is a slow-moving mountain village, with quaint shops, friendly locals and beautiful lake vistas. It is a place to enjoy the snow and mountains, while avoiding crowds of people. A friend and I spent a weekend in the town last December, staying at the modern, yet rustic Lake Arrowhead Resort and Spa, located on the water, at 5,100 ft. above sea level. Our getaway began upon checking into a luxurious room overlooking the majestic lake. The suite featured two queen beds, a 32-inch flat-screen TV, mini-bar, and free wireless internet. It also boasted a large balcony, from which we breathed in crisp mountain air and watched ducks play in the icy-cold water and snowflakes fall on tall pine and birch trees. Beyond the room, the rest of the hotel is no less inviting. After undergoing a recent $18 million renovation, the 162-room Lake Arrowhead Resort and Spa is highlighted by beautiful modern lodge architecture and numerous five-star amenities. There is a stunning lobby with timber walls and a large stone fireplace, crackling amidst cozy leather chairs and sofas and Native Serrano Indian art. There is also a giant Christmas tree, surrounded by ginger bread houses and a toy railroad. Above the lobby is the 11,000-sq.-ft. Spa of the Pines, a full-service luxury spa with nine treatment rooms, beauty salon, retail boutique, sauna, whirlpools, locker rooms and daily aerobics, Tai Chi, Pilates and yoga classes. The spa features signature treatments such as a specialty combination massage featuring a mixture of Swedish, deep tissue, Shiatsu, Thai and reflexology. There are also packages such as the Ying and Yang Couples Package, with an array of body treatments and ample pampering. The spa also features a state-of-the-art fitness room, where I spent my first afternoon on the treadmill, watching cable television on my own treadmill screen. After the workout I hit the steam room and Jacuzzi. The workout prepared me for dinner at BIN189, the resort�s award-winning gourmet restaurant. Led by chef Joseph Antonishek, the establishment serves creative �up-scale mountain cuisine,� accented with Mediterranean flavors. Our dinner at BIN189 began with two appetizers: Smoked Trout Tartar, with cucumbers, tomato concasse, mint, and pickled sweet peppers; and Signature Seafood Chowder, with lobster, clams, mussels, bay scallops, tarragon, and a puff pastry. For the main course I chose Peppered Venison Loin, with pancetta, port wine-shallot reduction, Brussels sprouts, and mustard Sp�tzle. This creative dish was not only delicious, but also stylishly presented. My friend selected Niman Ranch Pork Chop, a culinary delight with bourbon and molasses rub, house cured bacon and au gratin potatoes. Other dishes worth mentioning (and seeing) are the �Rock of Lamb� and the Hungarian Goulash. The lamb is Australian and is served tableside in an enclosed terra cotta clay pot. When ready to eat, the server carefully breaks off the clay, exposing a magical and exotic delicacy. The goulash comes with a lot of love and features slow braised veal, marjoram, hot paprika potato gnocchi and parmesan. For seafood lovers, the restaurant offers dishes such as grilled Idaho trout, with saffron �paella� risotto, rock shrimp andouille sausage, English peas and basil; pan roasted Atlantic Salmon, wild mushroom dirty rice and fresh vegetables; and Maine Diver Scallops, with pancetta, green grape reduction, Brussels sprouts king trumpet mushrooms and creamy cauliflower polenta. After dinner, we put on our coats and walked a couple hundred yards to snow-covered Lake Arrowhead Village, for live music and a cold beer. Here we discovered numerous unique shops, restaurants and a super market. And because December is slow season, the village was peaceful and romantic and free of crowds. For more information on staying at Lake Arrowhead Resort and Spa, or to learn about current specials, visit www.laresort.com or call (909) 336-1511. The resort is a �pet-friendly� establishment. For information on Lake Arrowhead and nearby skiing options, visit www.lakearrowhead.net. Life Points, Ltd., a Vancouver-based company who has designed Life Points, a Facebook application to track life events and give Facebook users a chance to win a trip for two to the beautiful Fiji Islands. The contest ends December 31, 2009. The winner of the online contest will be announced by January 2, 2010. To enter, simply go to Life Points (www.getlifepoints.com) and click �Want To� next to your preferred Fijian Life Points Experience. The hardest part will be deciding who to take with you! As part of the online contest, which is designed to prove that Fiji is the �Life Points Capital of the World,� the grand prize includes five nights of resort accommodations, and a choice of five popular adventure experiences in Fiji, in addition to the roundtrip airfare for two. Life Points is a Facebook application that acts as a virtual diary of cool life experiences. Life Point users visit the application to record activities that they have done as well as create a list of all the life experiences they wish to undertake in the future. They then have a collection of Life Points for everything they have completed, which can easily be shared with friends. "We are providing an opportunity for participants to customize what they wish to experience in Fiji and are offering a host of unique adventures for the winner ranging from shark diving and jungle zip-lining to hot air ballooning and thermal mud baths," says Regional Director The Americas for Tourism Fiji Ili Matatolu, who feels Fiji is one of the best places to earn Life Points. For more information regarding the contest or travel to the Fiji Islands, contact Tourism Fiji located at 5777 West Century Boulevard, Suite 220 in Los Angeles, California. The tourism board can also be contacted directly by calling (310) 568-1616, via fax at (310) 670-2318, or by email at infodesk@bulafiji-americas.com. Visitor information is available at www.fijime.com, the official website for Tourism Fiji.